This is my Godmother. She's not the one I was given when I was christened as a baby. That was Aunt Louise, who was a lovely person, I'm sure, although I don't really know because I never really knew her. Joan Santomenna is the mother God gave me when I was 14 years old. My dearly loved Mommy was sick all of my life and really incapable of taking proper care of me as I entered adolescence. I came to a saving knowledge of Jesus Christ in Joan and Rol's livingroom. She guided me around, and sometimes through, the pitfalls of teenage life. And at the center of every conversation was Jesus. The answer to every question was the Lord. Every situation, every dilemma was brought before the throne of God. That's not to say that I was always prepared, or that life always flowed and there were never any waves. But she always reminded me to turn to the Lord with any problem. Two years ago Joan treated her husband, my beloved Rol, to a cruise through the Panama Canal. Having been through a difficult health situation, she asked me to paint a cane for her to use on the voyage. 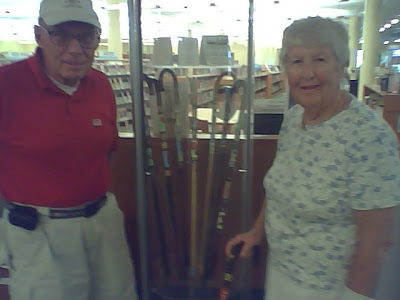 Leaning On The Promises, hand painted puzzle canes. What a lovely tribute, Judy. She sounds like quite a blessing. You turned out pretty darned good so I'd say they did alright by you Miss Judy. Your canes are a very nice accessory. Your painted canes are beautiful, and so is the story of your godmother. Wouldn't it be wonderful if all adolescents had someone like that in their lives? What a sweet story...Thank you for sharing it...your canes are so unique and beautiful! The story of your Godmother and how your canes came to be gives them all the more meaning.I admire your detailed art on them.